We have installed new power sockets and USB charging points for sixty study spaces across 3 silent study rooms in The Sir Duncan Rice Library. When we opened the Library in 2011 these silent study rooms in the south west corner of Floors 3, 4 and 5 (Rooms 324, 424 and 524) operated with a “no devices” policy to support those who preferred a silent reading/study space. However, the rooms have been under-utilised and student feedback from surveys and focus groups was for additional study spaces where laptops and other devices could be used away from the main floor areas. Funds recently became available to upgrade these spaces and the work was carried out in the first 2 weeks of Easter vacation. In most instances there is one power socket and one USB charging point assigned to each study space in the room. However, for cost and cable management reasons, this is presented as a double socket on every second desk. 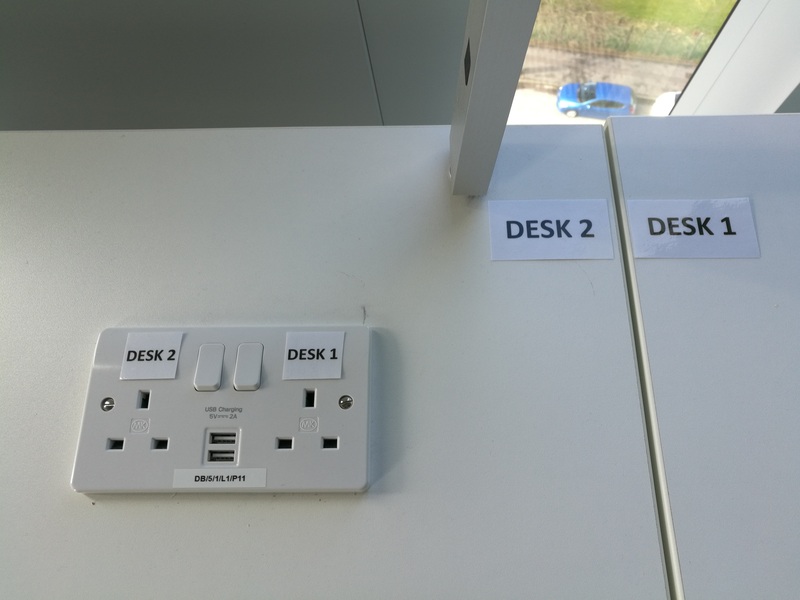 Desks and sockets are labelled so that each user can see which socket/USB charging point is assigned to the desk they are working at. See below. Please speak with library staff on the floors if you have any queries on using these rooms.